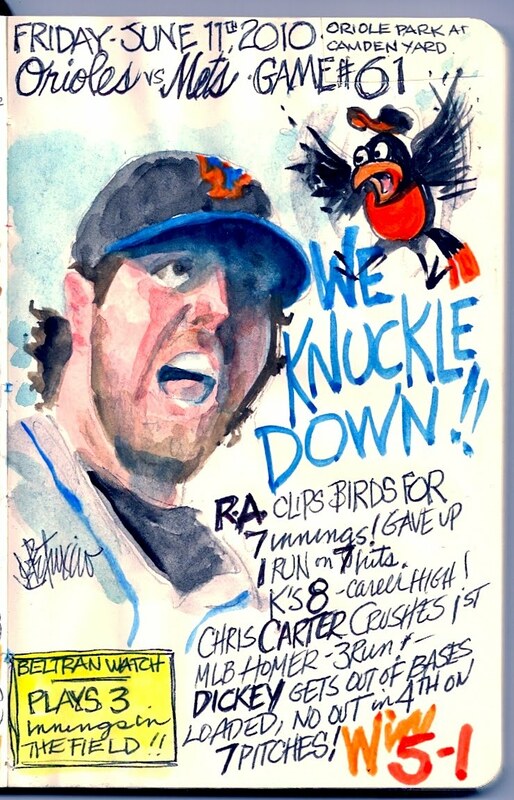 My Mets Journal: The Dickey & Carter Road show! Brilliant!... now i have my 11 yr. old, son a Mets fan, hooked! Right after the game he says to me " who do you think the Artist Joe will paint for tonight's win. we both went with R.A.! ... well done. Kept checking the site after the game and decided to check one last time before bed... this one is awesome! I hope you have two more reasons, tomorrow and Sunday, to draw a scared Oriole! R.A. looks great in this, and he's looking great on the field - thrilled to see that the Mets are only 1.5 out of first place, and I absolutely can't wait to see your work during next week's Subway Series! Let's Go Mets! I can't WAIT to see what you draw the day Beltran finally rejoins the club! PS: Love the Ollie in the Box drawings...hysterical! You make my night after every game. LGM! to carry on the tradition! R.A. is one of the top pitchers in the NL East! I hope to see more great starts out of him. You are becoming a big part of my daily routine. I love it. I just love your watercolors and art. Thanks for the props! I'm glad to have you all behind me! I know I will finish this journal for the first time.